Treehouse living for grownups, luxurious and lofty. Here, there is absolutely nothing between you and the amazing views of jungle-clad volcanic peaks and lilting Caribbean waves. That’s because every room at Ladera, perched loftily a thousand feet above the coast between St. Lucia’s distinctive Pitons, has only three walls—the fourth is open to sky and sea and cool breezes, making you feel like you’re living in a treehouse. And what a treehouse it is! Each of its 26 suites and villas is different, crafted from tropical woods and hand-laid stone, decorated with antiques and local art. All have their own plunge or swimming pools (some with waterfalls), and some units have their own kitchens, so you needn’t stir from your aerie at all unless you want to. There are, of course, many reasons to bestir yourself, among them the resort’s award-winning Dasheene restaurant, which serves Creole and contemporary cuisine with an emphasis on fresh fish and locally grown produce. You might descend to the beach to sunbathe, snorkel, or scuba, or venture upward to explore the rain forest or scale the heights of Gros Piton or Petit Piton, if you’re feeling adventurous. 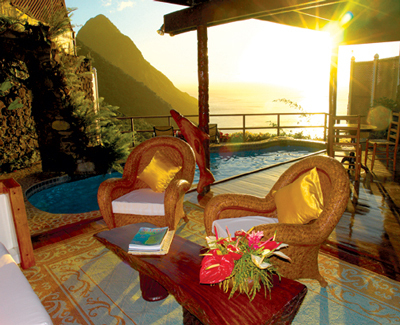 But the most gratifying experience at Ladera is one that’s on the agenda every morning: waking up in your romantic, four-poster bed and opening your eyes to that indescribable view. Now that’s life at the top!